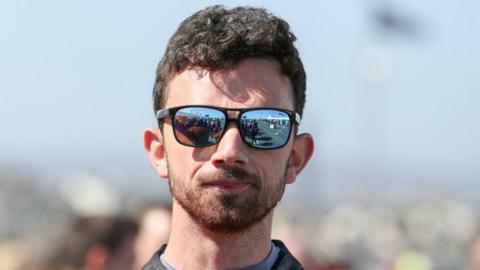 Glenn Irwin is confident he can achieve wins and podiums in this season's British Superbike Championship, which starts at Silverstone this weekend. The Carrickfergus rider has occupied mid-table places in pre-season testing after switching from Ducati to Kawasaki but believes he will be on the pace. "The bike is suited to my style of riding. Testing was difficult but there were a lot of positives," said Irwin. Irwin, 29, finished third in last year's championship. The three-time North West 200 Superbike race winner took his maiden victory in the championship at Silverstone in 2017 and won a race at the final round of the 2018 season over the Brands Hatch Indy circuit. "My position in testing is not where I expect to be or where I think I will be this weekend," added the Quattro Plant JG Speedfit Kawasaki rider. "But testing is for trying out different things and we have made a big breakthrough electronically. "It was nice to feel the difference in that area and we now have a clear direction to go in ahead of the first round. Every rider is different; we just need to find a setting that works for me. "It's not uncommon to be in this position at this stage so it's not a big worry. Overall, I feel good on the bike and the package is good. I'm riding well and pushing the limits. "I fought for victories at Silverstone last year and the aim is to be contesting for podiums and wins every weekend - some weekends it will happen, some weekends it won't." Glenn is one of five Northern Ireland riders in this year's 12-round series - brother Andrew, British Superstock 1000cc champion Keith Farmer, Josh Elliott and David Allingham make up the quintet. Andrew Irwin is expected to challenge strongly as part of the Honda Racing set-up, with Eglinton native Allingham stepping up from the Supersport class with EHA Yamaha Racing. Fermanagh rider Elliott has impressed in pre-season testing on board an OMG Racing Suzuki while Farmer, from Clogher, enjoys a prime berth as part of the Tyco BMW outfit. A third Irwin brother, former motocross competitor Graeme, will take in the Superstock class, along with Jordanstown's Andy Reid, who campaigns a Tyco BMW. Alastair Seeley, Lee Johnston, Ross Patterson, Richard Kerr and Eugene McManus are in the Supersport category, with Junior Supersport champion Eunan McGlinchey, Simon Reid, Caolan Irwin, Sam Laffins, Kevin Keyes and Korie McGreevy in Superstock 600 action and Scott Swann in the Motostar and British Talent Cup.